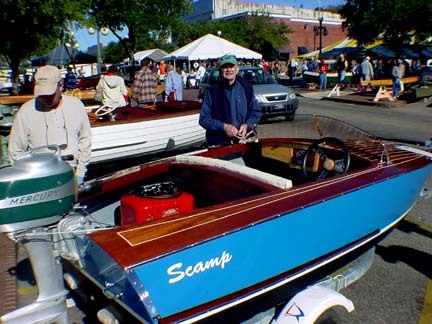 10/24/04 We have been here in Charleston, SC for 4 days taking in the sites and talking to people about the boat. We are in City Marina and will head south again tomorrow. I was hoping to get up some of the photos I have but the wireless internet here is by subscription so I'll wait untill one of the docks has it for free. I expected it here but it's not to be. I'm using the cell phone for a modem and it's very slow. 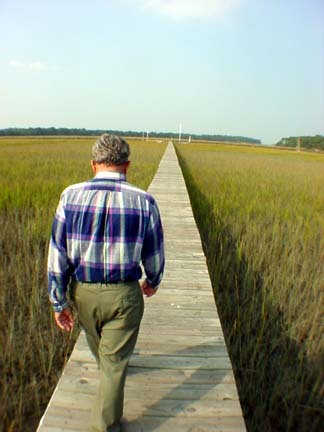 Charleston is a wonderful town with lots of things to do and see. There is an air of southerness about this place that you don't get anywhere else. We had lunch today with Mark Van Abbema's (our designer) sister, Mary and her husband Steve. We had a chance to see a beautiful stone fountain that Mary is carving for a customer and Steve showed us his retsoration he is doing on their home. We had a good time. I'll post more as soon as I get a faster connection. Ashpoo River. Very quiet until we awoke this morning to hear guys in boats shooting across the river. I'm not sure what they were hunting but they appeared to be shooting down into the grass from their boat. Not a very sporting way to catch crabs! Maybe flounder?? I wish I knew. 10/28/04 Debbie and I were riding our bikes along the highway the other day and stopped to cross at a light. A lady pulls up, rolls down here window and says "I know you guys! We met in Oriental". Later that day Debbie and Carl Hahn stopped by the boat to explain that we had met at the Georgetown show and not Oriental. I knew her face but was having a hard time putting her in Oriental. 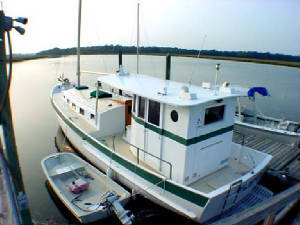 Carl offered to take me out to his beautiful home overlooking the marsh in Frogmore and show me the Chesapeke Bay buy boat that he had built some time ago. 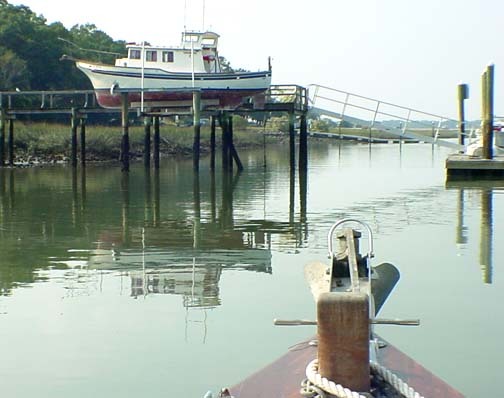 The Buy boats were used on the Bay to carry oysters and crabs from the watermen to the docks. After a tour of Carl's wonderful wooden boat we took the skiff he made and cruised the creeks and rivers around his island. I have always been amazed by the amount of life in and around the water that can only be seen from a small boat. I spent hours and hours as a kid looking into tidal pools in Florida at all the sea life and it still hold my fasination. We stopped at Dawtaw Island marina to see the 20' Cat boat that Carl has for sale. Another beauty!! 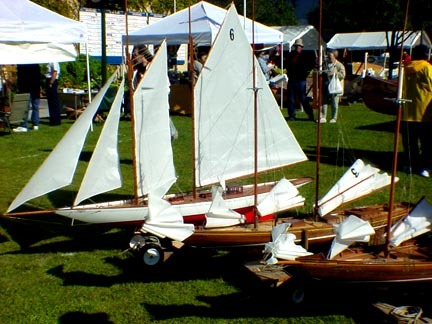 Carl has enough wooden boats to put on a show by himself. It'll be a lucky person who gets to buy the cat boat. Carl brought me back to the boat after a wonderful afternoon on the water. I can't think of a better way to spend the day. Debbie and I will be stopping by Carl and Debbie's dock on the way home next Spring to visit again. 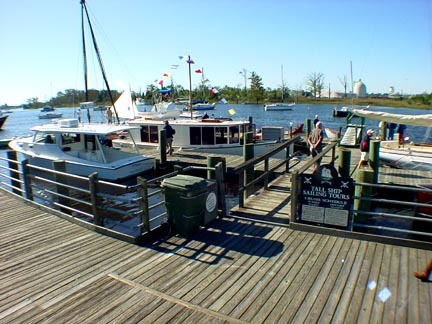 A note about Ladys Island marina. Joe and Candie are running the marina this year and they are the best hosts we have had yet. 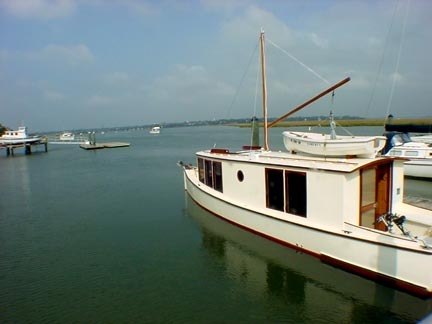 If you get a chance to cruise to Beaufort make sure to stop and see them. You will be glad you did. 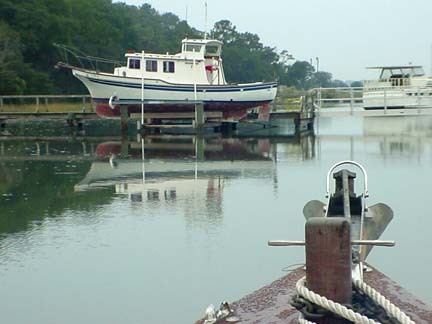 They are cruisers too so they know what boaters want from a marina.